What are the most affordable carbon road bikes worth riding? Carbon fibre entered the cycling scene with a bang. It’s a material that has been heralded as being incredibly strong yet phenomenally light. For cyclists, that’s pretty much the holy grail. In fact, true carbon fibre is at least 10 times stronger than steel. Hard to believe, yet true! The downside to this amazing material is the expense. Since the product is far more labour intensive to produce, it pushes up the price of finished bikes. Here’s the good news: now the technology is more mainstream, and cheap carbon fibre road bikes have finally arrived. But are they worth the risk? You can find some amazing, feather-light rides at unbelievable prices nowadays. I wouldn’t recommend everything out there (not all carbon is created equal), but there are a few diamonds worth seeking out. This piece is written to help any road cyclist or triathlete who wants to upgrade their ride without seriously damaging their bank account. We’ll be reviewing a handful of light, responsive and fast carbon road bikes, all available at discount prices. Specifically, we’ll attempt to keep the budget below $2000. Curious to see what’s out there? Read on. There’s absolutely no denying that carbon fibre is a lighter material than steel. I’ve checked out bikes that you can lift with a finger, no joke. With a bicycle that light, you will have a lot more energy when tackling a climb or passing during a race. It honestly feels like flying. Vibration: I’ve heard people claim that carbon generates frame vibration. In fact, it’s known to do the opposite. It will soften your ride considerably, especially when compared to a super rigid material like, say, aluminum. Does Not Oxidize: A major advantage in a carbon frame is the lack of oxidization (rust.) Both steel and alloy will oxidize to some extent, typically the parts not covered by paint and exposed to the elements. From a maintenance perspective having a rust-free ride is a huge boon. Frame Fatigue: All bicycles are susceptible to frame fatigue. Basically, over time the impacts and wear of riding will slowly degrade a frame’s integrity. However, carbon fibre frames typically experience very little frame fatigue, and most manufacturers offer long or lifetime warranties on them. The Talon by Kestrel was somewhat unprecedented when it arrived a few years ago. It has gotten more outlandish. Not only is it a beautiful, sculpted, full carbon road bike frame with excellent components, it is substantially less expensive than most of the competition. It’s a carbon fibre road bike for a little over $1,000, which I find hard to believe. What’s more, it comes equipped with some great components. Don’t let the affordable price tag fool you, this frame is impressive. It’s a full aero style, meaning it’s gorgeous. I particularly love the front and rear fork blades. It’s a blend of 800k and 700k carbon fibre, resulting in a ride that’s stiff enough for tight control, yet flexible enough to be a comfortable daily cycle. The frame geometry is such that it’s a great carbon fibre road bike for triathlons, yet also perfect for regular street use. The Talon is fitted with excellent Shimano 105 shifters (integrated) and derailleurs, fitted to an Oval double crankset that has 50/34T, which uses Oval external bearings. I’m a big fan of this setup. If you’re willing to jump up a few hundred dollars in price, Kestrel offers an Ultegra-equipped model. Outstanding value there. The brakes are quite basic, standard Tektro dual pivots. Despite their humble design, they’re still effective and do the trick, but this might be an area to upgrade down the road. The wheels are 700c Oval alloy clinchers with 20 spokes in front and 24 in the back (further weight savings). They spin nicely and arrive equipped with Equinox folding tires. The Talon comes in at 19.2 pounds in total, sans pedals. It’s a triathlon bike, but I find them very versatile. Change out the bars to whatever suits your fancy and you truly have an all-around bicycle, perfect for casual riding, racing, commuting or triathlons. You’ll love the responsive and snappy ride and explosiveness of the takeoff and acceleration. Quite impressive indeed, considering this is one of the cheapest carbon fibre road bikes you’ll come across. The Talon has great reviews from customers too. You’re not likely to be disappointed here. Diamondback is a well established brand, and lately they’ve launched into performance cycling. Carbon is a big focus. The gorgeous Diamondback Century 4 is an eminently affordable carbon road bicycle with a lot to recommend it. It doesn’t hurt that it’s easy on the eyes either. The frame and fork are made from high-end carbon which yields a stiff and responsive yet supple ride. It’s a ‘specific modulus’ frame, meaning the carbon tubes are constructed in such a way as to reduce weight to the lower limit, with techniques such as removing excess material inside the tubes post construction. The forks and frame are less ‘aero’ than some other options. I see this more as an everyday road bike and commuter than a racer. That’s reinforced by the geometry: you’ll sit a little bit more upright than many extreme carbon rides. That makes the Century 4 a strong choice for those with back issues, or for anyone who doesn’t need a hyper-aggressive stance. There’s no fancy groupset here, and it’s a reason why it’s so inexpensive. Diamondback instead opted to go for a set consisting of a Shimano Tiagra front and rear derailleur, and a set of Tiagra 10 speed shifters. I can only assume this is a cost saving measure since these are pretty basic. Even so, it shifts beautifully when tuned up properly, and you should have plenty of gearing options to play around with. The crankset is a 50/34T Shimano RS400 set, a great all-around gearing for fast starts, hills and flats. Brakes are once again simple and effective here, with Tektro Lyra flat mount mechanical disc brakes. Like many carbon frames, the brake cables run inside for a clean appearance. The wheels are C2+ from HED Cycling, and they feature 20 spokes on the front and 24 on the rear. They’re alloys with machined sidewalls, and they spin really well. It’s worth noting that several other components are alloy, including the seatpost and stem. I haven’t had a clear answer from Diamondback on this, but around 19 pounds. The Century 4 is a good answer to anyone who wants a carbon frame with a more upright stance. It’s quick and strong, with a good drivetrain and fantastic wheels and tires. If you’re a commuter, a fitness cyclist, or interested in a well-balanced ride, it’s probably the perfect choice for you. 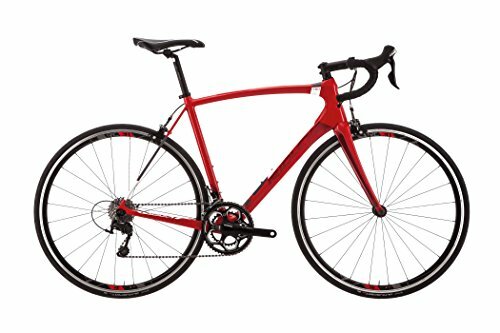 A budget carbon road bike with good looks, positive reviews and ride versatility? It’s a great pick. Fuji is another big brand. The advantage of this is they’re able to leverage their size to procure deep discounts. That means an otherwise expensive frame is affordable due to economy of scale. The Gran Fondo 2.3 C is another bike that’s built for a well-rounded riding style. Whether you like to push your times or simply get to and from the office, it’s a lightning quick friend in all situations. The frame is a full carbon construction, and it is smooth, aerodynamic and beautiful. Their C5 high modulus carbon is engineered to provide maximum rigidity and minimum weight. The geometry is a bit more upright, with a longer head tube and longer wheelbase. This gives you a good combo of great control mixed with ride comfort. Forks are aero and gorgeous. Unlike many in this price point, the Gran Fondo 2.3 C comes with a complete set of Shimano Ultegra shifters and derailleurs. Ultegra is better than the already excellent 105; I’m surprised to see it here. It’s not quite a complete groupset, since the bike makes use of an Oval forged crankset with 50/34T. Due to the premium drivetrain, this bike shifts like a dream. It is snappy, precise and a joy to run through the gears. Acceleration feels effortless. Fuji sticks with Shimano for the brakes, going with a 105 brake set (dual pivot). They’re very effective and efficient. Through-frame cable housings ensure a clean aesthetic. It comes with a set of Oval 327 alloy clinchers paired up to Vittoria Zaffiro slicks (you can read more about this excellent tire in our review here.) With 20 / 24 spokes, they’re strong enough, light in weight and spin for days. The seatpost is carbon, but the stem is forged aluminum. It comes in at a spritely 18.5 pounds, depending on the frame size. This bike is truly an impressive machine. The best words to describe it would be tight, precise and explosive. The best thing about it is the chameleon-like quality of the ride. It’s a sprinter, a commuter, a racer or a tourer. Ride how you want. 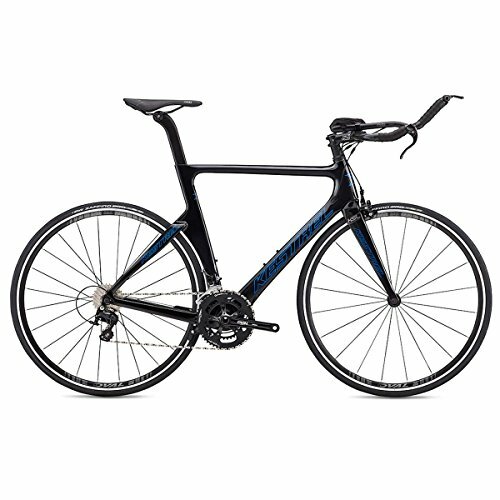 In any event the Gran Fondo easily makes this list as one of the best full carbon road bikes for around $2000. With Nashbar, no one could ever claim that their bikes are too flashy. Free from fancy paint jobs and gaudy stickers, their bikes tend to be as stealthy as you can get. That’s the brand in a nutshell. But don’t let that fool you into thinking they’re not capable machines. 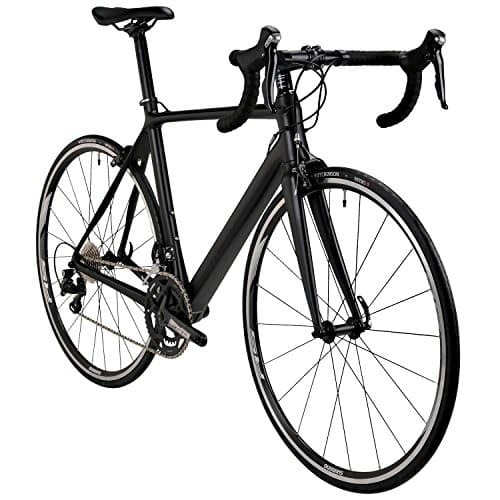 The bike is a monocoque framed carbon road bike with good reviews. For your dollar, it’s probably the best value in this list. I’m not sure how Nashbar managed to put together such a strong frame without adding weight. It’s almost beefy. The tubing is thick yet aero, utilitarian yet beautiful. It’s a stiff ride, but it is still forgiving on bumps due to the construction of the rear seat stays and front forks. That stiffness translates into unreal handling, so it’s a win-win. Nashbar implements the excellent Shimano 105 set for its drivetrain, including front and rear derailleurs, shifters and levers. I always prefer when the set matches like this. You’ve got 2×11 speeds to play with. The crankset is the ever-popular FSA Gossamer Compact with a 50/34T setup. It’s paired to an FSA MegaExo bottom bracket and the whole thing feels very dialed in. In fact the shifting is basically flawless. Nashbar has done well here. When you want to stop, standard Tektro 325 alloy dual pivots are more than up to the task, stopping you on a dime. They are basic, but who cares; use the money you’ve saved and upgrade to your heart’s content. Wheels are basic Shimano RS010 clincher alloys with machined sidewalls. Certainly nothing fancy, but they do the trick with 20/24 spokes. It rolls on a pair of Vittoria Zaffiro tires. As expected, the stem and seatpost are alloy. No surprises there. No official weight provided by Nashbar. Unofficially, it comes in at a little over 19 pounds, depending on frame size. 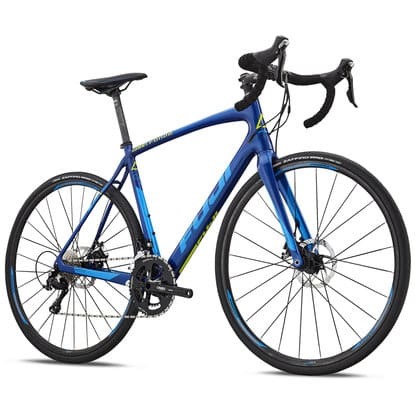 This is top-value carbon fibre road bike with good reviews and a great, budget-friendly price. You can’t lose. It’s well below the $2000 price tag limit we set, and in fact it frequently dips below the $1,000 mark, which I can’t really comprehend. For that you get full 105 drivetrain and a ride that’s a ton of fun. Recommended. Ridley has more than a few carbon bicycles in their quiver, so they know their stuff. With the stunning Fenix C line, they’ve set out to create an ‘endurance’ styled bike that suits a lot of road riding styles. The Fenix carbon frame is just gorgeous. A thick, oversized downtube makes it look fast, tough and aggressive. I also appreciate the taller headset (as a tall guy) and sturdy chainstays. Given its shape I might classify this as an endurance bike. The stance is a tad more upright and controlled, easier on your back without taking away from its capability. The frame is stiff and you can compete and thrive on this platform. Once again, we find the exceptional Shimano 105 groupset at work. And it is a true groupset, with shifters, derailleurs, levers, crankset and cassette all being official 105. The set works brilliantly together, and shifting is a joy. The bottom bracket is Shimano RS410, a Pressfit 30, which works wonderfully and saves weight. The equipped Ridley house brand 4ZA calliper brakes are quite powerful. The frame rolls on a set of 4ZA alloy clinchers with 24 spokes on each wheel, coming in at 1,810g. The tires are Continental Ultra Sport IIs, an excellent choice to start out. The bike also makes use of 4ZA for the the seatpost, stem, handlebars and saddle. It’s excellent, race-worthy stuff. It comes in at 20.15 pounds for a medium frame. A great looking bicycle from a great brand. I like that they’ve invested their own house branded parts into this bike, and the full and complete 105 groupset sells this one for me. In addition, the frame is comfortable enough for almost any riding style, yet rigid and agile enough to thrill you. In short, it’s a fantastic and cheap carbon road bike at a discount price. Carbon isn’t cheap, and it likely never will be. It’s a premium material and it’s labour intensive to produce. However, you can still find steals. My suggestion is to seek out older models. Bike shops carry old stock for years. High-priced bikes often take a while to sell. It’s not uncommon to see a model on the showroom floor from a few years back, brand new and never ridden. Why? Because high-priced models don’t sell nearly as fast as $300 comfort bikes. They’re aimed at a niche clientele, and sometimes that person doesn’t materialize right away. Honestly, there’s pretty much no difference between a new 2016 model and more recent stock. Don’t be afraid to haggle either. Take advantage of the super inexpensive road bikes with carbon frames collecting dust at your local bike shop. Alternatively, look at used bikes. An expensive carbon bike has probably been babied. You may just find an affordable, well-cared-for, second-hand bike in your area. I hope this was helpful! Thanks for reading. There are some major innacuracies in this article that stem from long held urban legends and out of date information about carbon that goes back to the early days of using the material in bikes. Carbon bikes these days are incredibly strong and are every bit as durable as aluminum and steel frames. Everyday falls and crashes are not necessarily the end of a carbon frame; not anymore likely than any of the other frame materials… Um, my full suspension mountain bike takes scrapes to the frame, regular OTB crashes and impacts from babyhead sized jagged rocks in rugged phoenix arizona trails, without issues. Additionally, carbon is VERY repairable – sometimes more cheaply and DIY than steel. Lookup carbon fiber repair – there are numerous reputable companies that have been making cracked and broken frames not only safely ridable again, but stronger than they were from stock. It is nice to see some carbon fiber bikes for sub $2k prices. I always counted them out of my reach until now. 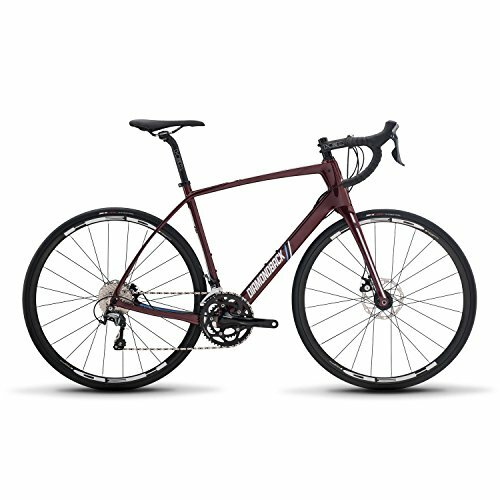 I have always loved riding bikes, but I need help picking out a real nice one to ride. Websites like this make it easier to pick them out. Its nice to see the specs and prices from an expierenced biker all in one place.